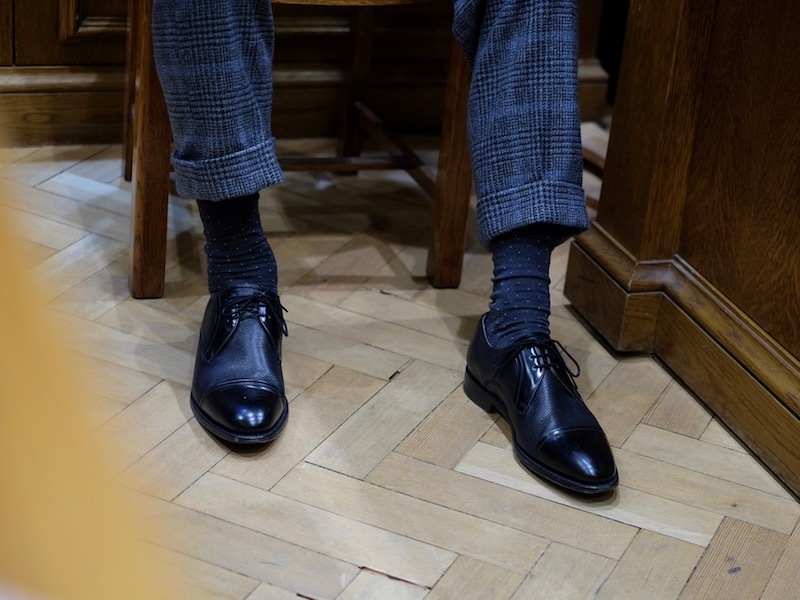 Our sartorial menswear expert explores the relationship between the trouser cuff, sock and shoe – and how to get it right. 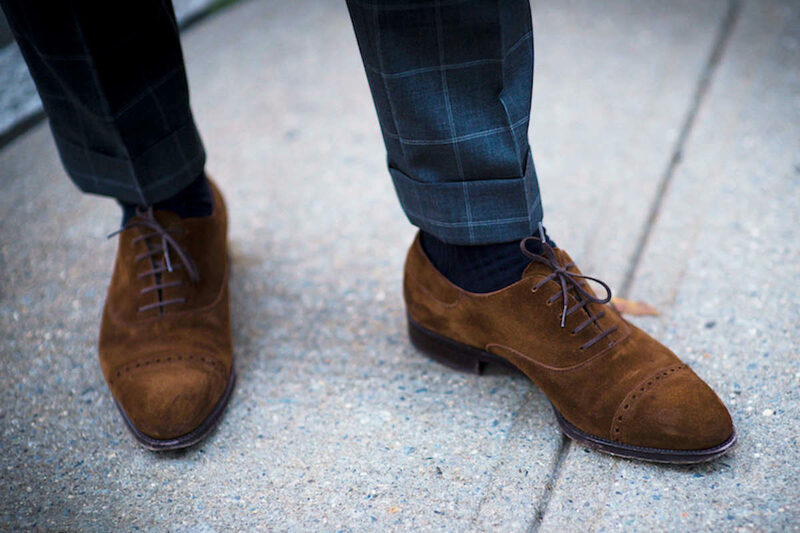 Manolo Costa pairs checked trousers with a deep PTU with brown suede Oxfords benchmade and hand sewn in Barcelona. Even the greatest bespoke suit by Edward Sexton or Cifonelli will lose its power if it’s poorly dressed and accessorised. Understanding how to combine tailoring with the right proportions and textures will not automatically make you the best dressed guy in the room; but you will be in the top half, I promise. Let’s start at the bottom and look at shoes and socks. Your trousers will either be finished with a PTU (permanent turn up) or they’ll be plain hemmed. If plain, insist that your tailor finishes with a slight angle so it is longer at the back. Military tailors can offer a more extreme version of this style that has an exaggerated shape, which works particularly well with boots but less so with loafers. If you prefer ‘cuffs’, as they are known in American English, you will need to specify a depth. This is your choice but the best-dressed gentlemen I know favour a deep PTU regardless of trouser width or their own height. Cuffs will capture dust and debris so have them brushed out regularly. You could elect to have them made with a small internal button that allows them to be fully rolled down, which makes the task of cleaning far easier. Remember, trousers should just touch your shoes or have a small gather or ‘break’ at the front, whilst hanging straight at the back. Your shoes are, of course, expensive and well-maintained. This does not necessarily mean they boast a military shine but they’re certainly polished or brushed. Until recently only black calf leather shoes were deemed smart enough to wear with a business suit in London. Thankfully those days are over and black, whilst still the most formal option, can now sit alongside oxblood, brown and even navy in the wardrobe. However, your shoes should be darker than your trousers. Suede and reverse calf offer texture and combine well with the nap of grey flannel. And the best way to combine the two is with a dark blue sock, rather than the tonal options of grey or brown. Adding another colour is more sophisticated. This is equally true when wearing jeans and a bottle green sock links blue denim to brown suede elegantly. Socks matter. The short and skimpy English sock is a source of national embarrassment. A visit to even a mid-market Italian or French department store will result in a good selection of proper, long socks available in real sizes. ‘One size fits all’, er … no, it doesn’t. Long socks (by that, we mean over-the-calf) stay up better and avoid that awful flash of pale, hairy flesh that suburban commuters like to share with each other whilst seated on public transport. Navy, bottle and wine solid-coloured socks will elegantly manage the transition from trouser to shoe. You do not need black socks. For black or white tie, wear dark red or a rich purple, and charcoal grey is elegant for morning dress. With summer suits and lighter shades try yellow or fawn. Never white. However, off-white or ecru are acceptable in tropical surroundings. Discreet patterns such as spots or plaids add visual interest, and you are under no obligation to match them in colour or pattern to any other item of clothing. Stronger patterns and colours should be reserved for odd trousers and sports jackets where argyles and bold stripes can complement tweeds and corduroy. Good cashmere socks are a genuine luxury and do not last forever. But socks are always better when new. There is something quite satisfying about wearing new socks. We all like to justify our clothing expenditure by the amount of wear we will achieve and that most quality clothes will actually improve with age; cotton shirts soften with each launder and benchmade shoes and denim develop a unique personality with age. We just don’t have the same relationship with hosiery. Perhaps that explains the reluctance by some to purchase decent quality but when you consider how bad socks will nullify your expensive suit they can be seen as a worthy investment. David Evans, author of menswear blog Grey Fox, wears Edward Green Derby shoes. The black leather vamps have a subtle grain, which softens the formality of the shoes and brings out the texture of his suit. David’s London Sock Co. socks peep unassumingly out from beneath his tailored turn-ups. 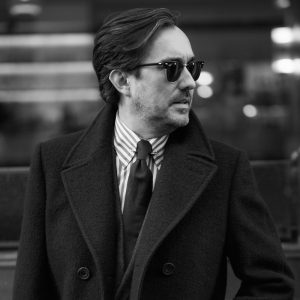 Christopher Modoo is 'The Urbane Outfitter', with twenty five years of experience in classic menswear. He has conducted suit fittings in both Beckingham and Buckingham Palace. He hates short socks.